David Anderle, Mike Bender, Jackie Burch et al. How did John Hughes capture the growing pains of adolescence so perfectly? Why do his films resonate with those that grew up with them, and those that have just discovered them? Why did he leave? Armed with those and many other questions, a documentary was put into production. It wasn't long before interviews with Hughes alumni and those influenced by Hughes transpired, shedding light on Hughes and his work. However, after 2 years of compiling hundreds of interviews there was still a very important one missing: John Hughes. 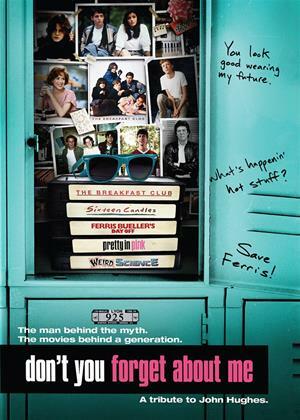 "Don't You Forget About Me" cuts insightful and entertaining interviews with the honest, humorous, and tension filled road trip the neophyte filmmakers make to Chicago hoping to secure an interview with the reclusive director and closure for themselves. Interviews with Kevin Smith, Mia Sara, Ally Sheedy, Judd Nelson, Andrew McCarthy and more!